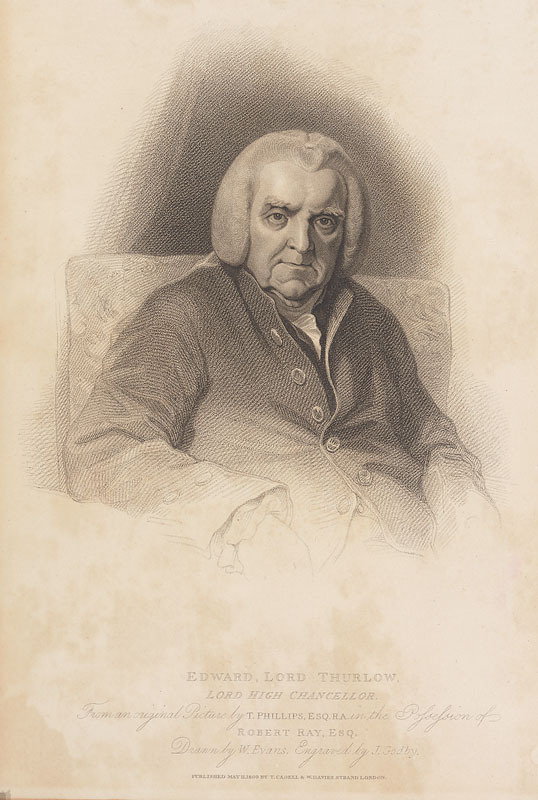 Edward, Lord Thurlow (1809) by James Godby via Harvard Library. The political career of Edward Thurlow (1731–1806), 1st Baron Thurlow, the Lord Chancellor, lasted 30 years but came to an abrupt end when his eldest and favourite daughter, Caroline, a gifted musician, eloped with Samuel Brown, on 26 April 1792, which provoked a breakdown in his mental health. It is said, that one of the Miss Thurlow’s eloped, from her father’s house, on Wednesday morning, for Gretna Greeen, with a military gentleman. Hampshire Chronicle, Monday 13 February 1792. Caroline escaped with Samuel Brown, a clerk at the Customs House, while she and her sister Catharine were staying with Thurlow’s friend Mr Hey at Coxheath in Kent. Hey had suspected that Caroline had feelings for Brown and had warned Thurlow of it. Thurlow spoke to his daughter but his words had no effect. 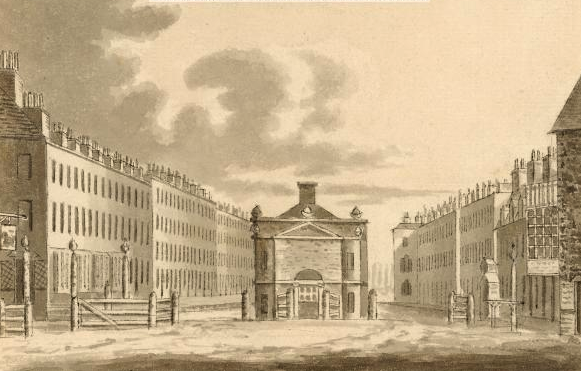 Caroline’s music teacher, Richard Stevens, learnt of Caroline’s flight and the events that preceded it from Thurlow’s coachman while he was waiting at Lambeth turnpike. Lord Thurlow’s Coachman (from Dulwich) came thro’ the Gate on Horseback; on seeing me, he said, “He has got her Sir! He has got her!” I could not understand this strange salutation: however, we retired some little way from the turnpike, when he told me the whole affair; and amongst other particulars the following curious circumstances. Mr. Browne, in order to work upon Miss Thurlow’s feelings, had suffered his beard to grow to an intolerable length, and had actually neglected himself till he was a horrid spectacle. By these appearances, Miss Thurlow fancying that he was in the utmost despair, and dreadfully ill, had been prevailed upon to walk a little way with him; (as I believe) without any suspicion of what was to follow; but when they were at a distance from Mr. Hey’s house, he put her into a Post Chaise and four, which was waiting, and took her away to London; from whence they immediately set off for Scotland. He was most dreadfully agitated and depressed, in consequence of this unpleasant and vexatious question, upon which a debate was expected, and actually took place; and the [Lord] Chancellor was obliged to sit as Speaker of the House of Lords, as the notice was too short for him to provide a Substitute. Mr. Baldwin, the Deputy Clerk of the Crown, was attending in his place, in the house of Peers this very day, and was astonished to see the tears trickle down the Chancellor’s face, all the tme that he sat on the Woolsack; and, wondered what could be the cause! The Chancellor’s band and front of his robes were wet with tears which he could not restrain even in that public situation. On their return to London the couple were married again at St Martin in the Fields church. 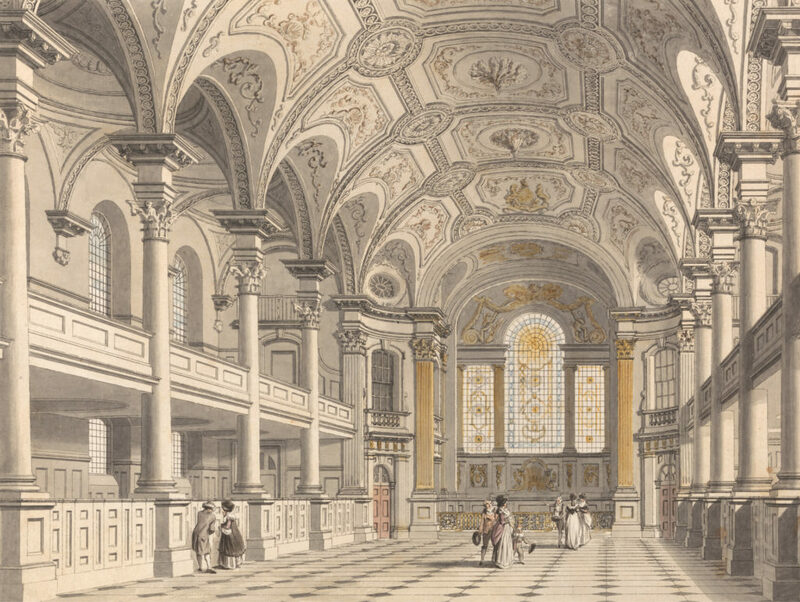 St Martin in the Fields Church, by Thomas Malton the Younger (1748–1804). Courtesy of Yale Center for British Art, Paul Mellon Collection. At first Thurlow clung to the idea that Caroline had been pressurised into the elopement.He sent an attorney, Mr. Lowton, to ask her about the circumstances of her flight. Brown and his sister Eleanor (who had accompanied the couple to Scotland as chaperone) implored Caroline not to incriminate them. “I have been ordered Madam, by your father Lord Thurlow, and the Lord Chief Justice of the Court of King’s Bench, Lord Kenyon, to call upon you and particularly to know from yourself whether your Elopement with Mr Brown was forced upon you, or whether it was with your perfect consent?” he said. After some hesitation Caroline replied, “If my father will permit me to see him, I will make a true declaration of all circumstances attending my elopement; but this, I hope to be excused doing, to Mr Lowton.” Thurlow was never reconciled to Caroline’s choice. According to Stevens, Samuel Brown was or had been a clerk in the Customs House, although newspaper reports stated accurately that he was in the military. Brown took a commission and served with Yorkshire Light Infantry and eventually rose to the rank of Lieutenant Colonel and assistant to the Duke of York. When it clear that Caroline had eloped of her own free will, Thurlow removed Caroline’s instruments from the family home and took down a portrait by George Romney of her and Catharine as children. He also declared that he would not speak to anyone who was in communication with her. Catharine agreed to this but Mary declared that “she never would give up the society of her dear Caroline, but with her life!” Her outburst, which left them both in tears, persuaded him to relent but he himself rejected her entirely. At the same time, his political career imploded. A committed and ardent Tory and royalist (he is remembered for his epithet “When I forget my sovereign, may my God forget me”) he finally fell out with William Pitt the Younger and was retired from office shortly after Caroline’s flight. The turning point was his rudeness to the Whig Lord Grenville, whose elevation to the peerage he resented (he was also Pitt’s cousin). Pitt and Grenville asked the king to choose between them and the Chancellor. Thurlow lost and it was arranged that Thurlow should retire on 15 June. The king created him Baron Thurlow of Thurlow, Suffolk. Sometime elapsed before Mrs. Harvey’s return with a message to this effect; “That if she would endeavour to compose herself, Lord Thurlow would consent to see her, tho’ he feared the interview might prove his dissolution”!! When she heard this, she immediately ran up the stairs to him, kneeled down at his feet, and seized his hand, which she held very fast. In this situation, they both remained a great while; both trembling, and most dreadfully agitated; she said, “My dear, dear, Father, I have suffered ten years of the most dreadful Misery, in losing your dear Society and affection. I know my error, I know what I have lost, don’t reproach me! but pray, pity and forgive me?” Still he could not speak to her, but sat trembling; his eyes still fixed on the ground, and his hand fast in hers, which he continually kept grasping. She waited a considerable time to hear his Lordship’s reply; but still, he could not speak to her. Finding that she had recovered the use of her speech, in a small degree; she hazarded nearly the following words: “There was a time, my dear Father, when I should not have experienced this dreadful silence. Oh! think how terrible it must be to me now?” With the most violent effort on his part, he did articulate the following words, in the greatest agony! “Oh name it not! Name it not my child! for God Almighty’s sake! name it not, if you mean to save my life!” The Agony, and horrible exertion, with this these words were uttered, made his Lordship so exceedingly ill, that he was obliged to leave the room. Hartshorn spirit, Brandy, and a variety of restoratives were brought by Bissy, and Mrs Harvey, in order to relieve him from fainting and the violence of his uncommon agitation. Tho’ he had spoken to Mrs Brown, in his agonising and afflicted manner; yet he never looked at her during the whole time of her stay with him. After his Lordship had been some considerable time in his bedroom, he sent Bissy to stay to Mrs Brown, “that if she intended staying at the Cottage, he must go to London.” Mrs Brown sent back a dutiful message to her father; then ordered her carriage, and returned to London. The next day, she wrote to him; and he immediately sent for her to Dulwich; and she resided with him there, and occasionally at Brighton, till the time of his death. Caroline died in 1858 aged 86 (Samuel died three years earlier). They had a large number of children, possibly as many as ten.